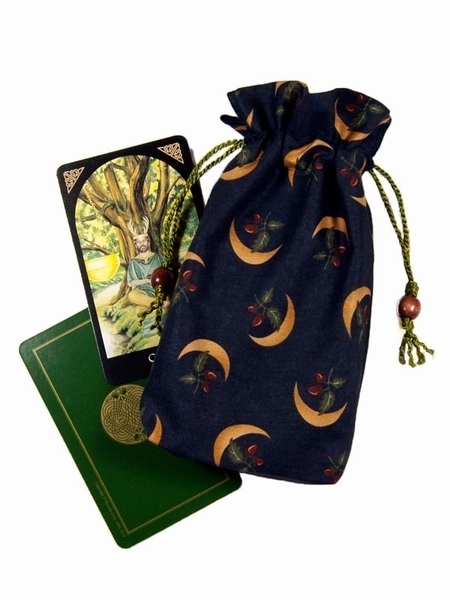 The powerful symbols of oak, acorn, and crescent moon make this Druid's Moon Bag an ideal choice for your tarot cards. Featuring a repeating vignette of two acorns oak leaves held between the golden horns of a crescent moon against a field of midnight blue, this tarot bag displays icons of wisdom, patience, potential, and a connection to the Otherworld. To some Celtic peoples, the crescent moon symbolizes Cernunnos, the Horned God of the Wild Woods. The moons here also resemble the golden sickles that (according to lore) Druids used to harvest mistletoe, a sacred plant, from the top branches of old oak trees (also a sacred plant) deep in Cernunnos's Wild Woods. In the Celtic tradition the oak and its seed, the acorn, are dual symbols of Druidic knowledge and power. A symbol of strength, patience, and wisdom, the oak tree holds a prominent position in a religion that sees divinity expressed in trees and nature. As the seeds of oak trees, acorns represent intense, concentrated potential and new beginnings. Deck Suggestions: There are many Celtic or Druid themed tarot decks that would coordinate perfectly with this tarot bag. Two of note are the Complete Arthurian Tarot (shown left of bag) by Matthew, Matthews & Gray or the Wildwood Tarot by Ryan, Matthews, and Worthington. For larger Celtic decks, such as the Druidcraft Tarot and the Sacred Circle Tarot, we have a Wide Druid's Moon Tarot Bag as well. PLEASE NOTE: The beads shown on the cords of this bag are no longer available. Size: Measures approx. 4-1/2" x 7-1/4" x 1" (approx. 11.4 x 18.4 x 2.5 cm). Fits most standard sized tarot card decks, 3-1/4" by 5-1/2" and smaller.